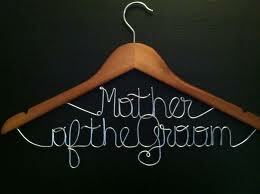 One of the important decisions when planning a wedding is the type and time of the ceremony that you will have. Many couples prefer a more casual type of event during the afternoon. Some couples plan outdoor events where attire that is more casual would be the better choice. If you are planning a casual or outdoor wedding, you can still find a beautiful gown. When you shop for your gown, you will find a large selection of short wedding dresses is available for you. Bridal shops including David’s Bridal and many retail stores that sell wedding gowns such as Nordstrom carry a variety of gowns for casual ceremonies. Any bride will look lovely in one of the shorter dresses on her special day. This lovely Beaded Mesh Dress by Pisarro Nights is ideal for any daytime ceremony. The tea length dress features a front and back deep V-neckline with a drop-waist. With the incandescent beads on the mesh overlay, the dress has a vintage style. The sleeveless dress is fully lined. This ivory colored dress is available at the Nordstrom web site. 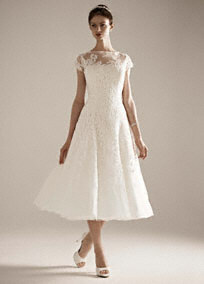 The pretty Cap Sleeve Dress by Oleg Cassini features beaded lace appliques and an illusion neckline. It is a tea length gown with style and elegance in ivory. The full skirt swirls with movement of the fully lined dress. The dress has a back zipper closure accented with small round buttons. You can find this lovely gown at many David’s Bridal stores as well as on their web site. For the bride that is looking for a fun and flirty dress, this One Shoulder all Over Fringe Dress is an ideal choice. The dress features a trendy one-shoulder bodice. The asymmetrical tiers of fringe add fun movement to the dress as you walk or dance and give it a vintage 1920s look. The cute ivory colored dress is fully lined with a side zipper closure. The flirty wedding dress is available at many David’s Bridal stores and on their web site. 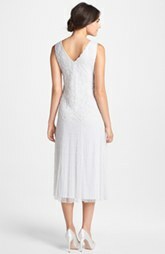 The Marina Lace Sheath Dress is a vision of loveliness in ivory. The demure dress falls just above the knee and features a floral lace overlay, iridescent sequins, and a square neckline. Wispy eyelash scallops accent the edges of the cuffs, hem, and neckline. The dress has three quarter lace sleeves and the back has a V-neck design. It is a figure skimming dress that will look lovely on any bride. The Nordstrom web site has the dress available. This Ruffled Chiffon Dress by Donna Morgan features a soft yet elegant look with a fitted bodice that has pearly bead embellishments to hold the floral ruffles in place. The pleated waist allows the silky chiffon skirt to sway and swirl with movement. The dress has a sheer yoke and back panel with a keyhole and rouleau-button closure. It is partially lined and has cups in the bodice for support. You will find this Donna Morgan dress on the Nordstrom web site. This Strapless Tea Length gown by Oleg Cassini features a snug fitted bodice embellished with beading and lace. The skirt is made full with the tulle that adds volume as it provides a flattering silhouette. The overlay on the skirt is adorned with lace and beading. The fully lined dress is ideal for any semi-formal wedding with old Hollywood glamour in a retro-chic fashion. The charming gown is available in many David’s Bridal stores as well as on their web site. The Strapless tea-length gown has a cap sleeve shrug and it is part of the David’s Bridal Woman collection and features a form-fitting bodice. A contemporary ensemble is ideal for less formal ceremonies. 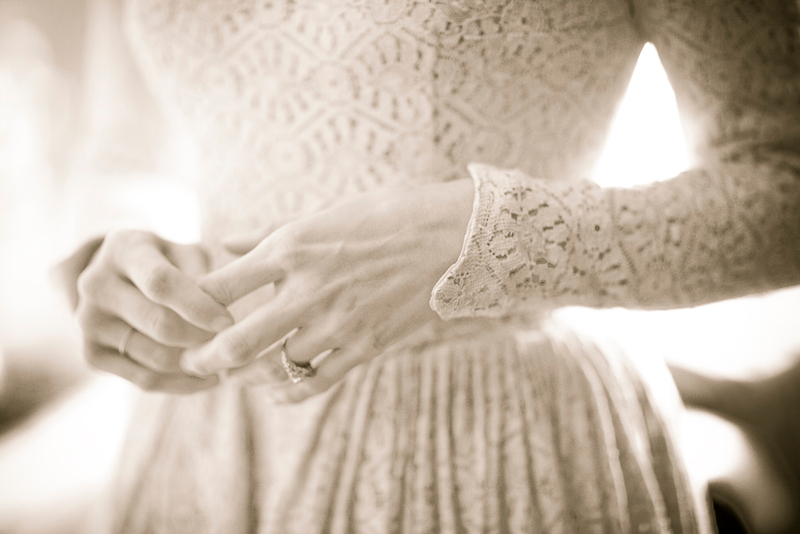 The shrug is made of lace and matches the gorgeous lace on the dress. The A-line dress has a satin ribbon at the waist. The lovely dress is available in both white and ivory and can be found in many David’s Bridal store locations. The Savannah Sheath Dress by Donna Morgan is simplicity tied with elegance. The strapless sheath has a straight neckline and slim pleated skirt. It is fully lined with a back zipper closure. The bow belt at the waist accents the classic lines of the dress. The white satin dress is found online at the Nordstrom web site. This Sweetheart Lace Dress by DB Studio features a peek-a-boo hemline. 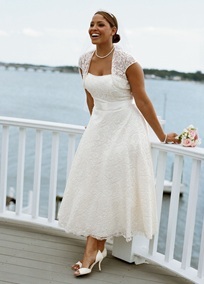 The vintage style of the dress is accented by the lace tiered skirt. The dress falls just above the knee and the skirt has tulle-flounced detail under the lace. A sweetheart neckline is on the strapless bodice for a feminine look. The dress is fully lined and has a back zipper closure. This timeless gown is available online at the David’s Bridal web site as well as in many of the stores. This lovely Strapless Embroidered Dot on Organza Peplum dress by DB Studio features a sweetheart neckline. The embroidered dot organza bodice has a grosgrain ribbon at the waist and a stylish peplum skirt detail that gives it 3D floral detail. The slim satin skirt is the ideal complement for the detailed top of the dress. It is fully lined with a back zipper closure. The sophisticated gown is available on the David’s Bridal web site as well as in their stores.